Variety is reporting that Ashton Kutcher will spend an upcoming hiatus from Two and a Half Men shooting a most unlikely project: a biopic of Steve Jobs. In which he’ll star. As Steve Jobs. Yes, Ashton Kutcher is playing Steve Jobs. The movie, titled Jobs, will be directed by Joshua Michael Stern, who last oversaw the 2008 political comedy Swing Vote, and will be written by Matt Whiteley. The project isn’t the only contender in the “Steve Jobs biopic” horse race, as Sony Pictures has its own flick — and theirs based off the Walter Isaacson biography — in development. 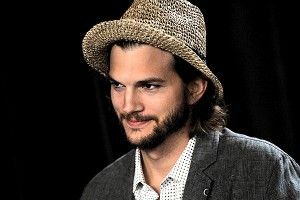 But Kutcher’s version is the scrappy indie, and might be biting off less to chew: It will trace Jobs’s journey from a “wayward hippie” to all-purpose media and technology demigod, but probably won’t go all the way up until his death last year. That means: no aging makeup for Ashton. Phew. Jeff Sneider, the Variety reporter who wrote the story, added on Twitter that “From what I’ve heard, JOBS will follow Steve from co-founding Apple & getting forced out to when he comes back. Not later years.” (Also:”“We discussed holding it until Monday for fear of readers dismissing it as a[n April Fool’s] joke, but felt it was too big a scoop to risk losing. It’s TRUE!”) Are you freaking out? Do you consider it blasphemy that an actor best known for male bimbo rom-com roles and hot tub-based extramarital sexual exploits would be allowed to portray a legendary American innovator? OK, take a deep breath, try to calm down, and remember one very important thing: At least at one point over their respective careers, both Ashton and Steve had beards.